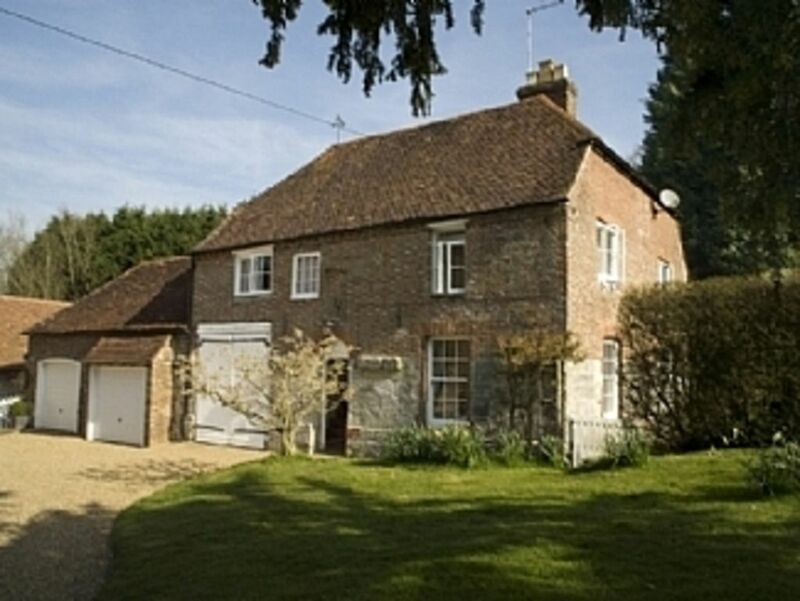 Charming, large, self-catering cottage, awarded 4 stars by English Tourist Board. Set in the owner's grounds with wonderful rural views and walks in the High Weald Area of Outstanding Natural Beauty. Situated on a quiet country road between Buxted and Framfield, the property has its own driveway, private garden with lawns, flowerbeds and courtyard outside the kitchen with seating and BBQ. The cottage is furnished to a high standard with original artwork throughout and modern conveniences, yet still retains its charm and old character. The spacious cottage sleeps 8 with two fireplaces, an Aga, four bedrooms, 2.5 bathrooms, and two sitting rooms, which make it extremely comfortable for one or two families or large groups. There are many historic houses and beautiful gardens to visit in the area, as well as charming country pubs. In addition, the cottage is perfectly located for visits to Glyndebourne, the coast and the historic towns of Tunbridge Wells, Brighton and Rye. The sunny sitting room with dual aspect views has a woodburning fireplace, two sofas and a stereo system. The TV room also has a woodburning fire with Colour TV, freeview and DVD player, a sofa and two armchairs. Tea, coffee and milk are provided as well as basic cleaning items. There are a variety of books on the shelves. There are many golf courses in the area, the closest being East Sussex National approximately 3 miles and Piltdown Golf Club about the same distance. Notes on accommodation: A travel cot, high chair and stair guard are provided. Outside: Large private garden with lawn and flower beds. Patio area and courtyard outside kitchen. Picnic table, small table and seating for 8 people. BBQ. Private driveway with parking for 2 vehicles. Utility Room: Separate fridge/freezer Clothes dryer Cleaning / Towels / Linen High quality towels and linen are included, the property is cleaned and towels etc are changed on departure of guests. A change of linen and towels is provided for longer stays. Other: The dining hall has a slate floor and large pine table with seating for 10 people. We chose the house because it was located close to Brighton, as three of us were running in the Brighton Marathon. The house was a lovely place and we enjoyed our stay there. It was just the right size for all eight of us to have our individual space, but also to have family time together. It had a nice outdoor area to relax. It was just perfect for us and we had a great holiday week here. The house was clean, spacious and very well equipped and we recommend the place. Thank you for your kind review. You were perfect guests and left the cottage spotless. Fantastic house, full of character. The cottage is a beautiful traditional house with lovely furniture and facilities. We especially liked cooking on the aga, but could use the modern oven too if needed. The beds were comfy and the house nice and warm. The situation is spectacular and very wild. Great for walking and exploring. Uckfield is 5 minutes drive away which has everything. We thoroughly recommend this place. The beaches of the South Coast are approximately 15 miles away. Eastbourne and Brighton being some of the closest. The cottage is ideally situated to visit many National Trust houses and gardens, Bodiam and Leeds Castles, Rudyard Kipling's house, Batemans, Sissinghurst and Great Dixter. Ideal for visiting Glyndebourne and close to the historic towns of Brighton, Royal Tunbridge Wells, Lewes and Rye, and the seaside town of Eastbourne. There are many great walks close by, the Weald Way is adjacent and the South Downs Way and walks along the South Downs are only 30 mins away. There are many award winning pubs in the area, some within walking distance. The Blackboys Inn is one of The Times top 50 al fresco pubs and The Griffin in Fletching has been voted one of the country's top 50 gastropubs. In addition, London is easily accessible by direct train taking just 1.15 mins, from the local station five minutes away.